Would you like to engage City Tech students in your research project ? Are you seeking research mentees ? Would you like to meet a cohort of our best, our brightest, and our most promising students ? 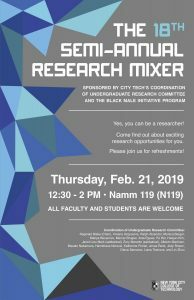 If you answered yes to any of the above questions, then please join us on Thursday, February 21, 2019 in room N119 (first floor of the NAMM building) from 12:35 – 2:00 PM for the 18th semi-annual Research Mixer event that is hosted by City Tech’s Undergraduate Research Committee. We promise that you will not leave the session disappointed. 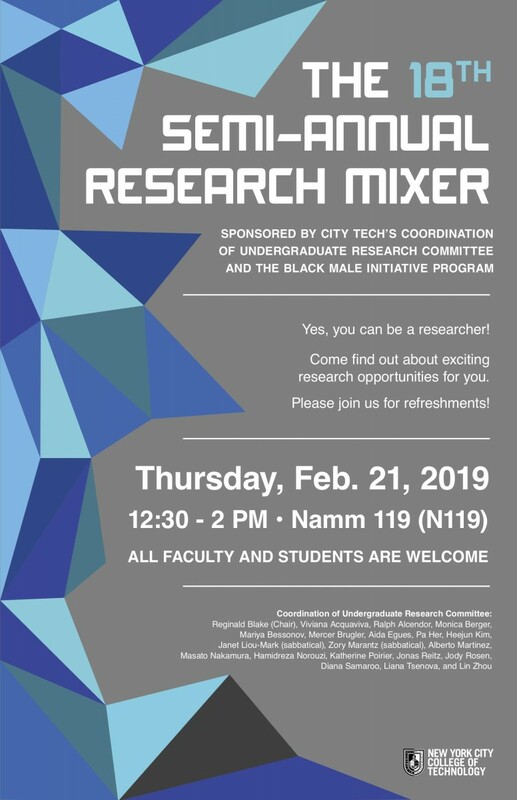 Bring a colleague with you and invite your students to come and explore the tremendous research resources that City Tech offers. This entry was posted in Faculty Opportunities, Mentorship and tagged Research Mixer by Jody R. Rosen. Bookmark the permalink.